TORONTO CATHOLIC WITNESS: Protestant-Modernism is the heresy behind the idea that "doctrine changes when pastoral contexts shift and new insights emerge..."
Protestant-Modernism is the heresy behind the idea that "doctrine changes when pastoral contexts shift and new insights emerge..."
Liberal protestant theology is behind the "Christological heresy" that proposes that pastoral practice can contrast with doctrine. For some background on this issue, please see an earlier article I wrote. Consider the words of Cardinal Muller: "Any separation of theory from practice of the faith would be a subtle, but serious Christological heresy". Will this pope rewrite controversial church doctrines? No, but that isn't how doctrine changes. Doctrine changes when pastoral contexts shift and new insights emerge such that particular doctrinal formulations no longer mediate the saving message of God's transforming love. Doctrine changes when the church has leaders and teachers who are not afraid to take note of new contexts and emerging insights. Thomas Rosica, CSB, and the English language Spokesman for the Holy See Press Office, phrased it in an extraordinarily similar manner in a lecture at Assumption University. The original video may be watched here. But is this actually true? Can doctrine change when pastoral practice shifts? Can Christ's unchangeable truths actually change? The answer is obvious. Now, we come to a recent interview granted by Bishop Athanasius Schneider on the attempt to subordinate doctrine to pastoral practice. Although these paragraphs state that the individual judgement of the conscience of these couples must be made according to the doctrine of the Church, there remains a lack of clarity. Those who promote the Communion for the divorced and remarried, as for example Cardinal Kasper and his group, state openly that while the doctrine of the Church remains, there is definitely the possibility that the divorced and remarried may receive Communion. So they acknowledged the possibility of a contrast between doctrine and practice. This is also the typical position of Protestantism. You keep the theory or the doctrine, the works are not so important and necessary. This is the dangerous principle of salvation only by faith. From no: 27. Hence, studying more closely the ideas of the Modernists, evolution is described as resulting from the conflict of two forces, one of them tending towards progress, the other towards conservation. ... The progressive force, on the contrary, which responds to the inner needs lies in the individual consciences and ferments there - especially in such of them as are in most intimate contact with life. Note here, Venerable Brethren, the appearance already of that most pernicious doctrine which would make of the laity a factor of progress in the Church. 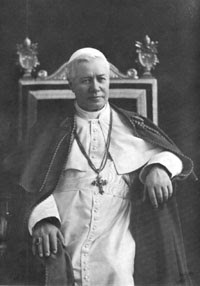 (Pius X, Pascendi). A concise and powerful article! In my experience—and I'm certain I'm not alone in perceiving the problem, given the many apt witnesses like yourself in the blogosphere—far too many people, lay and ordained alike, forget the necessary distinction between unchanging doctrine and changeable disciplines such as fasting and other spiritual practices. It seems that many dissidents use such terms interchangeably without providing any clarifications, and so low-information (c)atholics get the impression (or is it 'permission'?) that doctrine can change. We've seen the devastation in protestant circles created by those who have fully exploited the ambiguities. Though I'm completely confident the Holy Spirit protects the Catholic Church from falling into heresy, the real issue is how much damage will be/is being done by those who intentionally deceive others by creating confusion. Those same obfuscators (Card. Kasper, Fr. Rosica, et al) also cloud the issue by avoiding the distinction between development or clarification of doctrine and the changing of doctrine. Catholics do not change the teaching of Christ. Period. Some fundamentalist protestants might disagree with that statement, but the burden of proof is upon them to show how the Church that Christ founded and protects from errors in faith and morals—i.e., not some manmade community founded by dissidents—has changed what has been received from the Apostles.